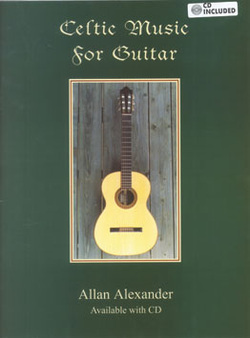 Celtic Music for Guitar by Allan Alexander contains 31 songs transcribed for guitar, most of them originating from Ireland and Scotland. The book also includes three charming original pieces written in the Celtic style by Allan. The music is presented in both music notation and guitar tablature (for people that do not read music). Play the beautiful haunting melodies of the Irish Harper O'Carolan, take a musical journey with dances that were written more than 400 years ago and experience Celtic traditional music that is the mainstay of modern players. If you are learning and looking for great music, this is one book that you will not be able to put down. If you are a performer looking for high quality material, these great pieces, expertly arranged, will become part of your permanent repertoire. Comes with play-along CD.